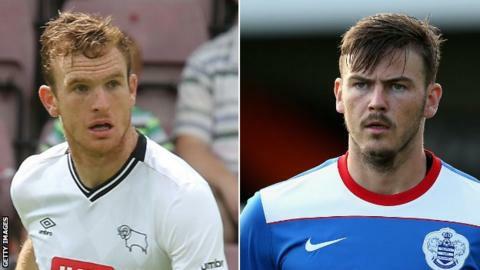 Bristol City have completed the loan signings of QPR midfielder Ben Gladwin and Derby County defender Alex Pearce. Republic of Ireland international Pearce, 27, joins the Robins until the end of the season after making just two appearances for Derby this season. Gladwin, 23, has agreed a 93-day deal, having already spent time out on loan with former club Swindon in 2015-16. Meanwhile, Gillingham have rejected three bids from City for 22-year-old midfielder Bradley Dack. However, Gills chairman Paul Scally refused to confirm to BBC Radio Kent whether the Robins had offered as much as £1m. Pearce and Gladwin are both cup tied so will be unavailable for Tuesday's FA Cup third-round match against West Bromwich Albion. "Alex will offer us experience - he knows this division inside out," said interim manager John Pemberton. "When I spoke to Alex, it's clear how desperate he is to get into the Ireland team for the Euros - if he does that then it means he will have played well for us." Gladwin, who only joined QPR from Swindon in the summer, will officially begin his loan on Friday, meaning he will be eligible to play for Bristol City for the rest of the season. "When we played Swindon last year he was always the one we picked out as a danger. He was always the one who caused us problems because he's a kid with exceptional ability."